In the future, a department of cybernetically enhanced cops race to find the true identity of the mysterious 'Ghost hacker' ("Ghost" in this 'era of AI' being the name of what we might rather call "soul" today) known only as the "Puppet Master". Can they uncover his true agenda and if they do, what will it mean to be human? Koukaku Kidoutai Another manga turned into an anime movie. 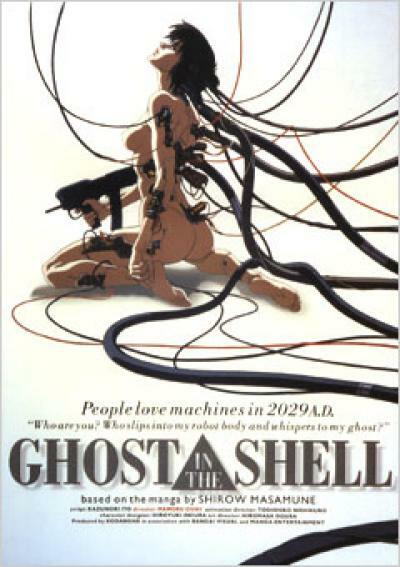 While the cyberpunk premise and artwork were clearly put into this film, there is still the issue of characterization and background details behind the setting of the movie. Ghost in the Shell clearly establishes its setting with a future for Tokyo where some of humanity has heavily modified itself with robotics to the point where they question if any bit of their humanity is left. The premise of the blurring line of one's humanity being intact despite heavy robotic modifications is established through Motoko Kusanagi as she questions it for herself during her search for details on the Puppet Master. However, much of the background and character depth covered for this plot is limited thanks to the limited amount of time the movie gives it and the fact much of the movie's focus was on the action. And in terms of the animatiion department, Ghost in the Shell won't disappoint with crisp, detailed artwork and fluid action scenes. It's just that this could have worked out better as an OAV so more time was focused on developing the backgrounds of the characters and giving me a better understanding of how robotics came to shape human society. As it is, Ghost in the Shell is worth a solid watch for those seeking a decent action anime movie to watch. Fans of the series who wish for greater depth on the characters can find it in TV show adaptations of the series like Stand Alone Complex. Last updated Friday, May 23 2008. Created Friday, May 23 2008. Koukaku Kidoutai Masterful piece of work which challenges the mind with human philosopy and its importance. The more times I watch this, the more I learn to appreciate how good it is (even if I think I know the story after watching it around 6 times). I would recomend this to an older audience of at least around 13 years of age otherwise I think you would be bored silly and wouldn't understand it unless you're a kid who can understand deep plots like this. The art and animation reflect the film itself as they too are very sophisticated. One thing I'll say is that you have to try and hang on to every word otherwise you may lose yourself. Last updated Thursday, December 15 2005. Created Thursday, December 15 2005. Koukaku Kidoutai This is a legendary, classic anime that has spawned so many noteworthy benefactors like The Matrix. It's more on the surrealistic, artsy side of the spectrum, so don't expect Hollywood-paced action, dialogue, and suspense. The patient, flowing montages of technology and society colliding/coexisting in future Tokyo streets is breathtaking (accompanied by deep, stirring chant music). Lost in Translation's cityscape/humanity scenes were filmed similarly, albeit with different music. The obvious mystery surrounding Motoko, the Puppet Master, and the other characters is appropriate and intriguing. We see enough to empathize with them and their perceived humanity, yet they remain distant, synthetic, and abstract - along with the very notion of a ghost/soul/identity in a hypertechno age. As is also the case with the SAC TV series, GITS gets a bit bogged down in overly-verbalized philosophy of existence and political treachery. As in most art, the most powerful messages don't need to be spelled out to be understood. But the film is spectacularly drawn and animated, creating a techno-realistic yet otherworldly existential impression. As important to cyberpunk anime as Star Wars was to Hollywood sci-fi. Koukaku Kidoutai Actually, I was kind of surprised that there wasn't as much philosophy in this movie as I had expected. More than most anime, certainly, but believe it or not I think Kikaider did a better job of addressing the question of what it means to be human. If I hadn't read all sorts of reviews beforehand, I doubt if I would have picked up the central issue--how much can you take away from a human being before it ceases to be human? (that was the central issue, wasn't it?). I thought the most intriguing scene was the one in which it is revealed to a lowly working man that his memories of his wife and child are artificial fakes--I wish they had taken that farther. Other than then, it seemed as if they just scratched the surface of what mind-twisting events might be commonplace in a cyber-culture. Ghost in the Shell turned out to be largely an action movie, and make no mistake, a good one. The animation was excellent--the level of detail that was included reminded me of Wings of Honneamise. After watching so much anime that started out as a TV series, being reminded of just what could be achieved if time and money were not severely limited was truly eye-opening. Lots of cyber-fan service, too! Last updated Monday, February 25 2008. Created Saturday, August 09 2003. Koukaku Kidoutai Hmm....well when I first saw this I didn't like it much at all. However, having watched other Oshii productions, plus the Stand Alone Complex, I'm starting to have second thoughts. I still don't think it's perfect, and it won't appeal to everyone, but I understand it alot better after multiple viewings. Ghost in the Shell very much follows the Oshii formula, so if you expect an all-out action fest you'll be disappointed. This is a deliberately paced and introspective movie, not afraid to favour dialogue and atmosphere over action. It is a quite like Patlabor 2 in that sense. While this does allow the characters to reflect on the motives of the Puppet Master as well as the nature of humanity, it leaves very little time for anything else. And this is the problem. At 80 minutes this movie is simply too short to do justice to its plot or its characters, both of which seem undeveloped. The Stand Alone Complex has more time to develop the characters as individuals, and to explore the reasons for Section Nine's existance. It's a pity this couldn't have been explored better in the movie itself, but there it is. It's still worth watching though, particularly if you can get your hands on Stand Alone Complex, and of course it is a must for Oshii fans. Last updated Sunday, November 16 2003. Created Friday, August 08 2003. Most importantly, the story works, although the time for evaluating characters seems rather limited. But the story line caught me so much that I didn't question the plausibility of the protagonists too much; I did want to see what is really going on, much like in Jin-Roh. Of course there is a lot of fighting sequences and high-tech battling, but this is never being used to just fill time. And what is unique for this Anime is that they actually put philosophic questions into the dialogs and make the viewer think about these, like "how do you define 'life' or 'person' or 'identity', once the cyberspace is in existence?". This can make you wonder, just like Serial Experiments Lain can. This movie made me want to see more of it. Sadly it is difficult to continue the story because of that type of end they chose ... so you have to go the other way round and start with the Koukaku Kidoutai STAND ALONE COMPLEX series (of which the "Puppet Master" movie is a sequel in time line), to get more informations about what the protagonists have done earlier. Starting with this one might be like entering the Enterprise universe by watching the movies and not knowing who Kirk and Spock are... still, it worked very well for me despite its deficits in the Character development area, resulting in a minimum "Buy" rating as for me the philosophic elements and their resolution were sufficient for a great experience. Last updated Sunday, January 10 2010. Created Sunday, June 08 2003. Koukaku Kidoutai This is a beutiful movie for the gory lovers! It's during the information era. The Puppet Master controls cyborgs to do his dirty work. You must see it to believe it! Last updated Thursday, January 30 2003. Created Thursday, January 30 2003. Last updated Monday, December 23 2002. Created Monday, December 23 2002. Koukaku Kidoutai An essential manga. The animation alone is worth a look. Not as deep and profound as everyone says, just quite gay. Last updated Wednesday, November 28 2001. Created Wednesday, November 28 2001. Koukaku Kidoutai Yeah, this is a good movie. Even though it deals with some pretty deep subjects that usually get muddled in anime, the story, to me, makes a lot more sense than that of say, Akira, and I like very subdued atmosphere the action takes place in. The whole thing just feels very Asian, as it's not all balls-to-the-wall action and lame dialog. Plus, it looks and sounds nice, as well. Whether you're a fan of Masamune Shirow's manga, Mamoru Oshii's filmmaking, or just a fan of good cinema in general, this film is definitely worth a spot in your DVD collection. Last updated Tuesday, October 16 2001. Created Tuesday, October 16 2001. Koukaku Kidoutai GHOST IN THE SHELL is a product of not only a lot of thought, but a lot off blood, sweat, and tears of the people who produced it. Truly its a visually stunning work under the theme that is more mature and abstract than most writers care to go and I give it all the credit in the world under those pretenses alone. GHOST IN THE SHELL was just one of those movies I really wanted to like, but after several attempts it has still failed to grow on me. A lot like AKIRA it just came off to vague for me to adore it. Either Im too dumb to get it all or the people who made GHOST IN THE SHELL were just trying to be too clever for their own good. I basically saw the movie as something I would have liked a whole lot more if it was a series rather than a movie as it seemed they were just trying to introduce too rich a world into such a small time frame. Of course, thats just my option. I found a lot to like about the movie (Even though it flew past breaking the sound barrier) such as animation which should be honored and the efforts spoon feed people a little thought with their graphic violence. I think people should definitely have a look at this movie and decide whether they understand it, dont understand, and love or hate it either way. Truly an acquired taste amongst otaku. Last updated Saturday, October 13 2001. Created Saturday, October 13 2001. Last updated Thursday, February 15 2001. Created Thursday, February 15 2001. Koukaku Kidoutai This film is great, unquestionably one of the best animes of all times. The story runs around two cybernetically enhanced cops who are hunting down a "Ghost hacker" known only as the Puppet-master. This film brings up the qestion os what it means to be human, like so many other films. But this one does it in a cool way, by asking the question of what is life. By any means you got to see this movie. Last updated Monday, January 15 2001. Created Monday, January 15 2001. Koukaku Kidoutai Undoubtedly, Ghost in the Shell is a defining piece of animie. With Mamoru Oshii's work winning Best Theatrical Feature Film and Best Director of a Theatrical Feature Film at the 1997 World Animation Celebration Awards, it's small wonder that this piece of animation, breaking from traditional lines of drawing, far surpasses even some of the best out there. Intelligently written, this piece of science fiction has no lasers or transporters here. This is an incredible work. Last updated Wednesday, January 03 2001. Created Wednesday, January 03 2001. Koukaku Kidoutai This is undoubtedly one of the bettter animes ever. I personally like the art which had a perfect blend of computer and hand drawn animation, and some of the ideas brought forth within where very interesting. However with all the hype surrounding this anime i felt vaguely dissapointed when I watched this anime. It doesnt truly live up to what people say about it. The dialogue at times is tired, the plot is convoluted at best, and the characters are not quite right, the arent dimensional however they arent fully develpoped... more two and a half dimesional. In summary this is a good anime, and will always be said to be one of the greatests however try not to go to it just because of the hype. Last updated Friday, December 08 2000. Created Friday, December 08 2000. Koukaku Kidoutai Unquestionably The finest peice of science fiction ever put on film, Ghost in the Shell never ceases to amaze, captivate, and challenge the viewer. A film of this calibre MUST be purchased by anyone who remotely enjoys good film-making. The animation is truly awe-inspiring, with computer enhancements so subtile one doesn't even notice them (Unlike most heavy-handed CG garbage like Blue Sub)with wonderfully deep and realistic characters who actually seem believable despite the fantastic circumstances. The character designs are unusually and wonderfully realistic, as opposed to the usual big-eyes and speed lines fare. The music is haunting and gave me goose-bumps it was so perfect. This is definately believable and realistic sci-fi. No ray-guns or warp-speed here. This film even surpasses the manga masterpiece it was based on. I am sorry I can't write more about the plot, but I would hate to spoil it for anyone who hasn't seen it. This is an intelligently written and artsy film, just the kind I love. Last updated Friday, January 18 2002. Created Monday, December 04 2000.